WED 11/16 (11:45AM) — Here’s the AAA-Elite Oakland playoff bracket through this past Sun 11/13. I guess Freddie hasn’t gotten around to posting the final scores from 11/13 on Twitter. Will have to happen soon, otherwise we can’t update this bracket and schedule 11/20. Also, there might NOT be a Repeat Championship. 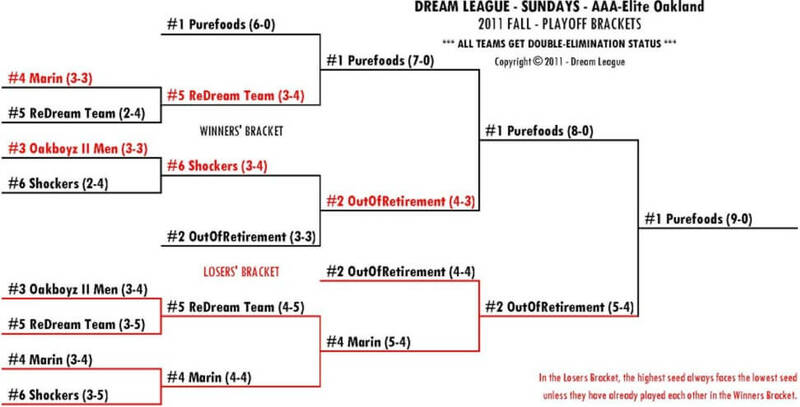 Instead, both teams would enter a single-elimination bracket vs AAA-SF and AAA-SJ. Now, if the winner of the Winners Bracket still carries double-elim status (i.e., beats the Losers Bracket survivor), then I might have to figure something out. Let’s see how it plays out. More on this later. I know the Shockers captain was upset about the two doubleheaders in a row, but quite frankly I was not looking that far ahead. It was just a natural progression of the bracket. If we didn’t do that, then the #1 and #2 seeds would’ve been forced to have a bye the first week, which is a toss-up on whether to do it or not. The other thing that messes us up is that on 11/20, we have limited gym time due to a birthday party at Bushrod. So as luck would have it, it’s better that we did it that way considering the brick wall at Bushrod on 11/20. Also, had the Shockers made it through to the Winners Bracket, they probably would’ve been happy that the Losers Bracket was embarking on doubleheader mode. Another example how in basketball, to the victor goes the spoils; that fine line between winning and losing.